In this CICLOPS contest to see which of our images taken over the last 4 years are the most popular, members of the CICLOPS Alliance first narrowed down the selection, from a total of about 1500 releases since February 2004 to a handful of the most spectacular. From the final candidate lists of 30 color images, 27 b&w images, and 20 movies, thousands of CICLOPS visitors between December 3 and December 30, 2007 chose their favorites. Many of these individuals wrote to us to say how difficult a choice it was: So many of our images and movies are such jewels that to choose one over the others was painful. In fact, a few told us the choice was so torturous they refused to vote! And now, here they are... your favorite Cassini images and movies of the entire mission so far. Enjoy them for what they are: The scenic visions that above all others exemplify what is glorious and otherworldly about the iconic ringed planet that we on Earth are fortunate to call our neighbor. 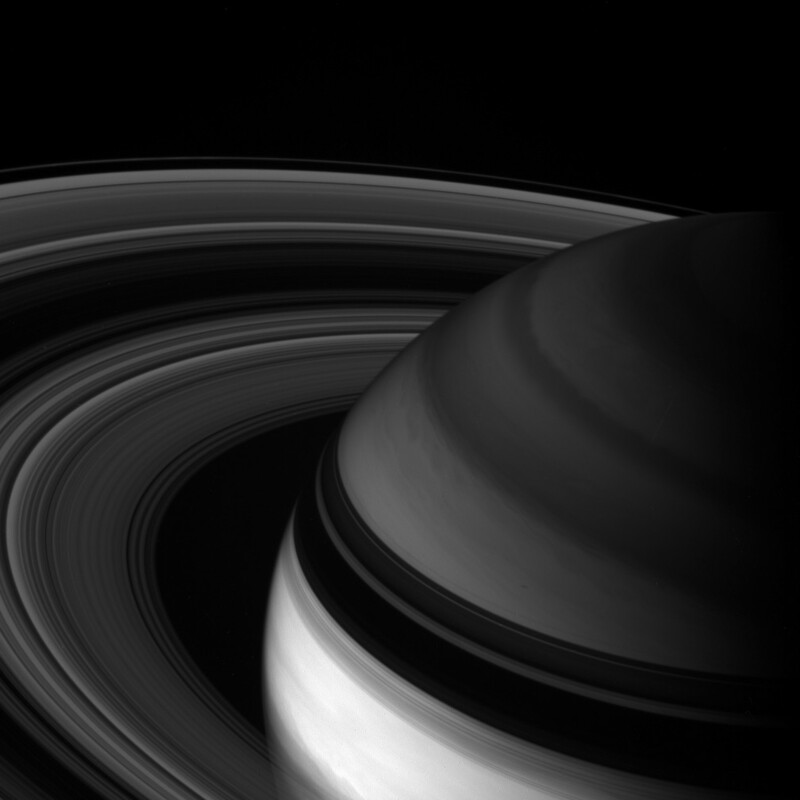 The clear outstanding winner of the Favorite Cassini Image contest in the Color category did not surprise any of us here. It is of course our one-of-a-kind image of a total eclipse of the Sun seen from the opposite side of Saturn ... an astonishing and gorgeous view that not only shows Saturn's ring system as it has never been seen before, but also captures the Earth, across a billion miles of interplanetary space, embraced as it were by Saturn's rings. This is an image that literally draws gasps from any audience to which it is shown, and is deserving of every accolade bestowed on it. It has even been described by some as "the most stunning photograph ever taken". There is something deeply moving about seeing our own little blue-ocean planet in the skies of other worlds, and most of you were so moved to choose this as the winning color image of the whole mission thus far. We at CICLOPS couldn't agree more! In the Black & White category, to within the margin of error, two images tied for first place. One is a brooding image captured of the high northern latitudes on the planet and the sweep of its rings below, in a light that penetrates the atmosphere more deeply than is normally visible to the human eye. 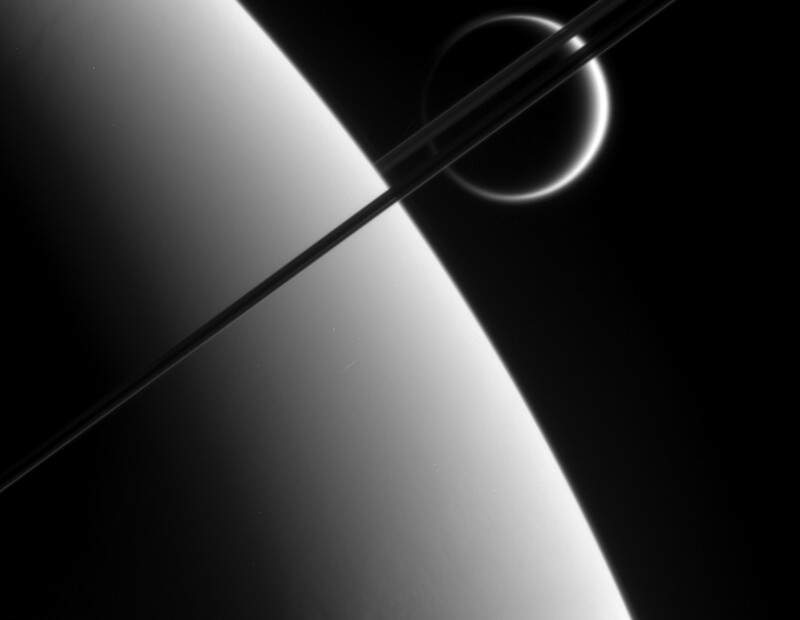 And the other is an abstract, Kandinsky-esque view of the brightened outline of Titan seen just beyond the limb of Saturn, both split by the thin, nearly edge-on rings. It's clear that our voters had a hard time choosing among all the fantastic monochrome scenes caught by our cameras, some rivaling the best graphic designs seen anywhere, because each of these winning images garnered only about 10% of the votes. And in the Favorite Cassini Movie category, again two tied for first place. One is a riveting, quintessentially Saturn sequence taken as Cassini plunged through the equatorplane and caught the sunlit rings seemingly collapsing down to a sliver and then unfolding again in the negative, all the while circuited by flock of racing moons. And the other is the 'Flight over Iapetus' made from images collected during last September's close Iapetus flyby. Our most technically challenging movie to date, this is a gripping, strap-yourself-in blast over the moon's high mountain peaks, and we were not surprised to see it rise to the top of this category. We at CICLOPS want to extend our great thanks to the thousands of you who voted. The contest has been a great success. Now meet the lucky individuals who were randomly chosen to receive a poster of the winning color image.